A captivating combination of the Grande Maison's technical mastery and exquisite rare handcrafts in this limited edition of 100 pieces. 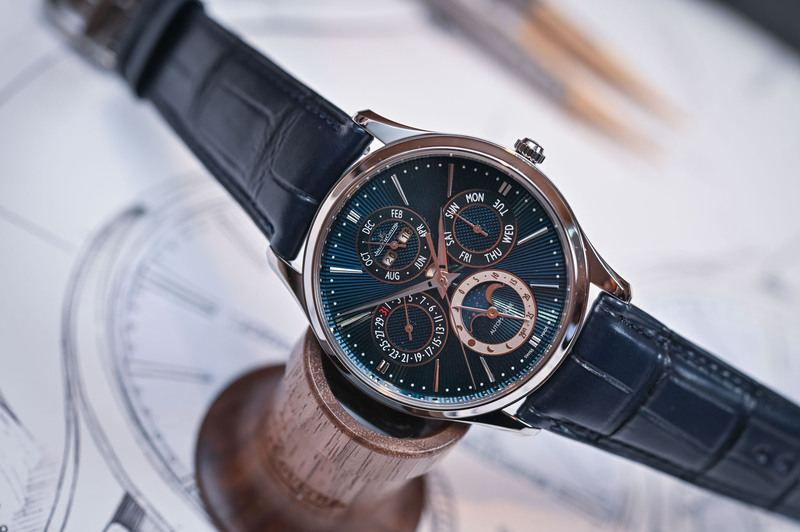 Since its facelift in 2013, the Master Ultra-Thin Perpetual has appeared in various guises, including the sleek black dial version we saw in 2016. 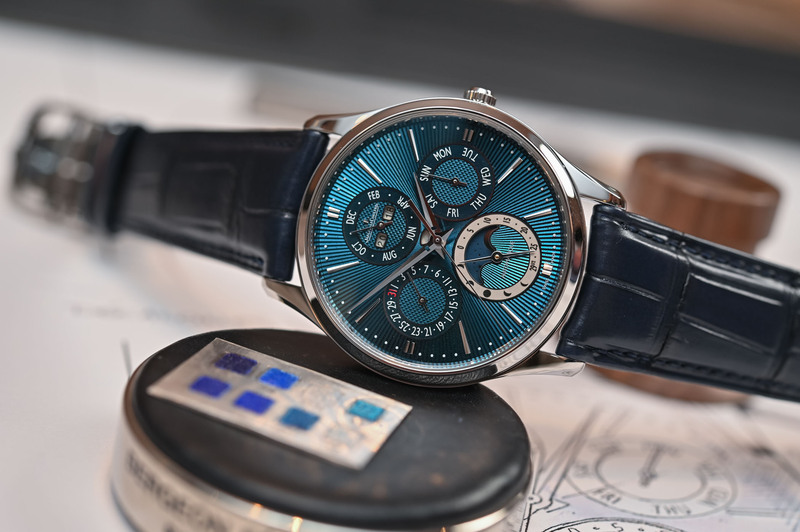 However, I think there is unanimous agreement that the 2019 white gold version with its blue enamel guilloché dial wins hands down. 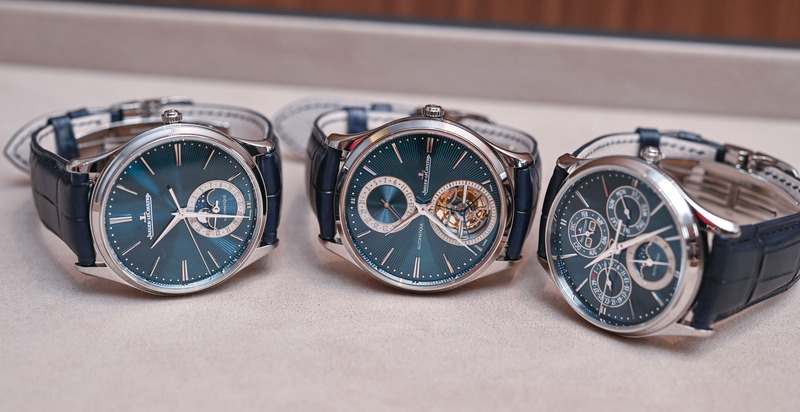 Released as part of a limited edition trilogy, including the Master Ultra-Thin Moon Enamel and Tourbillon models, the new members of the Master-Thin Enamel family stole the show. The watch we will be looking at today comes with a revised movement and display and indicates the phases of the Moon in both the Northern and Southern Hemispheres. The Master Ultra-Thin Perpetual Enamel we’re reviewing today is part of a sub-collection of 3 watches (all in limited production), depicting superb enamel/guilloche dials in translucent blue. 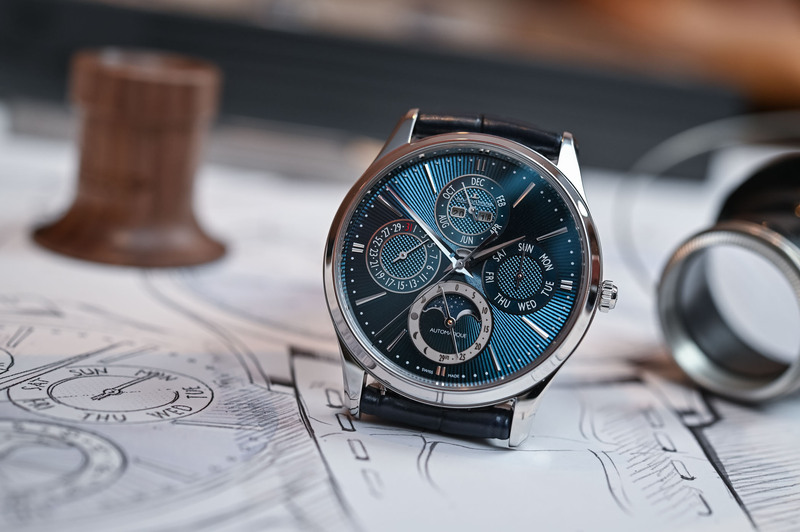 Like its predecessor, the case of the new Master Ultra-Thin Perpetual still measures 39mm but is crafted in gleaming white gold and has a slightly thicker profile of 10.44mm (formerly 9.2mm, mainly due to the new dial). But that’s about as far as the similarities go. With the changes made to the QP module on top of the famous calibre 868, the arrangement of the perpetual calendar indications has changed radically, swivelled around the dial by 180°. The Moon phase indicator is now at 6 o’clock (more elegant if you ask us), the year and months at 12 o’clock, the days of the week at 3 o’clock, and the date at 9 o’clock. Four sub-dials contain all the pertinent information and bring a pleasing symmetry to the dial. The only function that has maintained its previous position is the discreet “safety adjustment” indicator located just above the axis of the central hands (when red, you shouldn’t adjust the date with the quickset function, otherwise the movement will be damaged). Worth noting how the needle-thin hour and minute hands feature a small rectangular incision at their base to avoid blocking the view of the safety indicator. Depicted against a midnight-blue sky studded with stars, the silver Moon indicates its current phase in the Northern hemisphere. To find out what the Moon is up to in the Southern hemisphere, you have to consult the silver counter engraved with the numbers 0 – 29.5 on the right side, and on the opposite side symbols of the waxing and waning of the Moon. The hand for this counter has two tips, one points to the numerical age of the Moon on the right, while the second tip of the hand points to the phases of the Moon in the Southern Hemisphere. To celebrate its limited edition status, the hour markers have been reworked and are longer and more refined to reflect the fascinating texture of the dial. Blue dials might have saturated the market of late, but it is hard to take your eyes off the absolutely unique aqua-grey-blue colour and fascinating texture of this dial. What makes it so hard to pinpoint the colour of the dial is the way it plays with the light, changing from an almost metallic, electric blue to a darker, more midnight tone of blue. With its very own Métiers Rares (Rare Handcrafts) department on site, Jaeger-LeCoultre is able to produce some of the most extraordinary handcrafted dials (think back to those amazing miniature paintings on the Reverso). 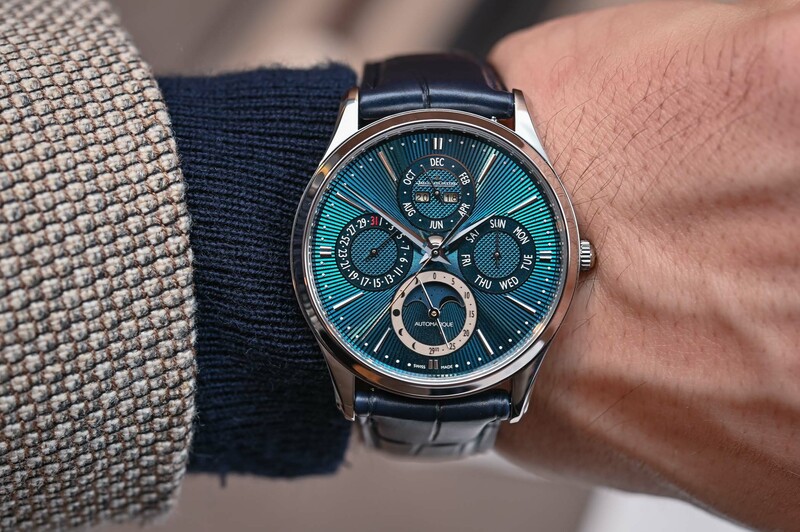 The dial of the Master Ultra-Thin Perpetual Enamel combines the art of a hand-guilloché pattern etched on the metal, which in turn is covered with a translucent blue enamel coating. The metal base features a hyper-elegant pleated pattern that tapers towards the centre of the dial. The combination of the cold white gold and the rays of metallic blue light that fan out across the dial produces a mesmerising effect and is probably one of the most elegant combinations I have seen in a long time. 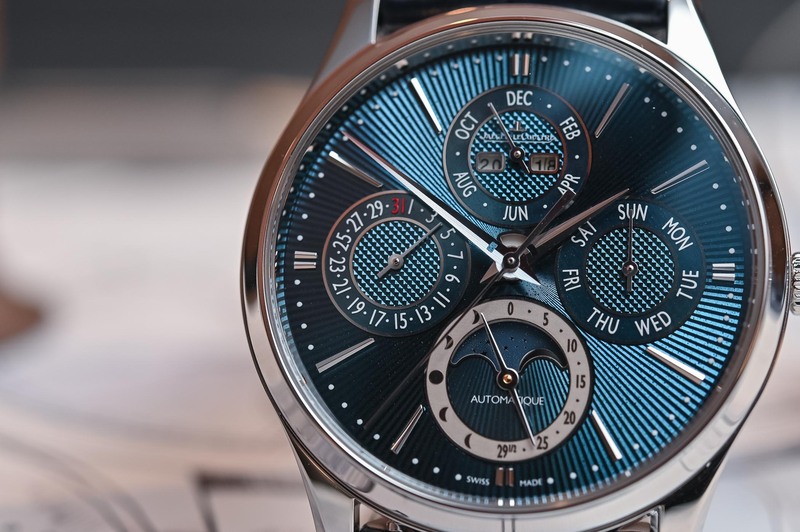 To highlight the perpetual calendar information, the sub-dials feature a slightly darker blue circular frame with a different style of guillochage (tiny pyramids) in their interiors, except for the Moon phase indicator that is framed by a silver ring and is nestled behind the same pleated background as the dial. The new alignment of the QP indications on the dial responds to the update performed on the JLC calibre 868, an automatic winding movement with a perpetual calendar, now known as calibre 868A/2. The power reserve has also undergone a generous upgrade and now offers 72 hours of autonomy on a single barrel and beats at 28,800vph. 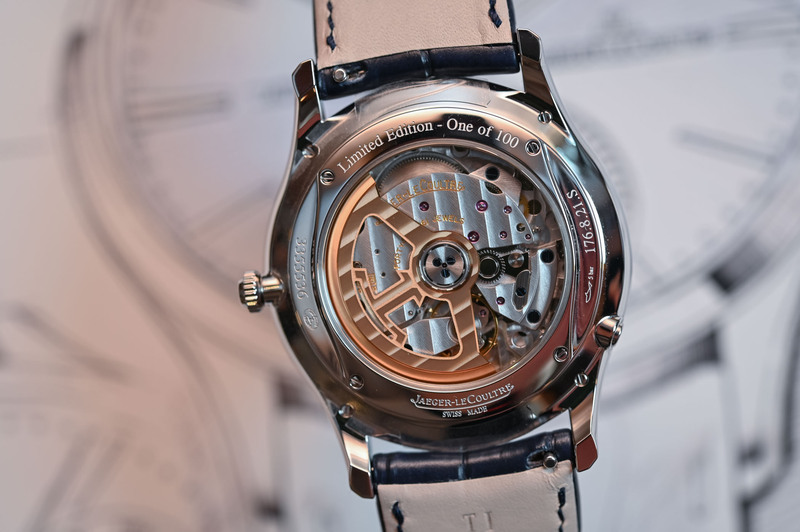 The sapphire crystal caseback reveals the handsome Geneva stripes on the bridges, the bevelled and polished edges, the blued screws, the perlage (circular graining) on the main plate and the openworked rose gold rotor with the brand’s logo. 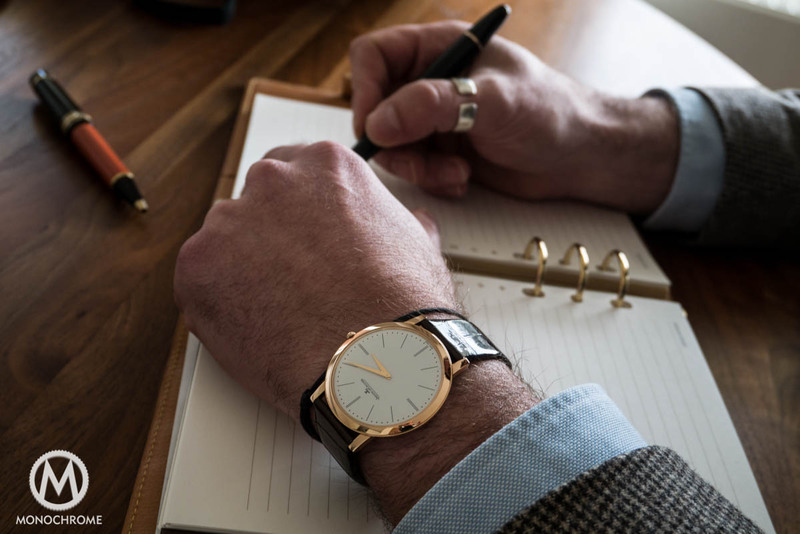 The white gold casing ring is engraved with the words Limited Edition and the corresponding number of the watch out of the total production of 100 watches. 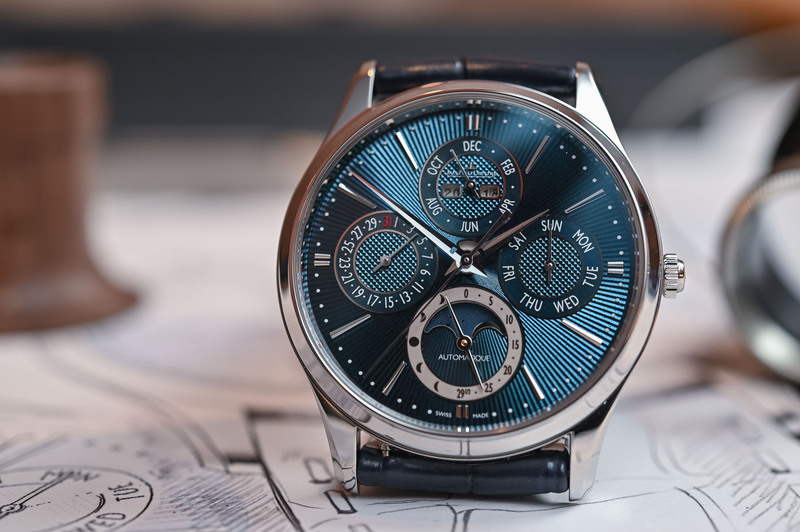 One of my favourite watches of the SIHH 2019, the Jaeger-LeCoultre Master Ultra-Thin Perpetual Enamel is a handsome ambassador of what the Grande Maison is capable of producing, on both technical and aesthetic missions. Perhaps the “ultra” adjective could be eliminated from the name of the watch because it is not really an ultra-thin watch. The white gold case and stunning blue guilloché and enamel dial are a radiant combination, and the rearrangement of the QP functions on the dial lends this watch a very pleasing sense of symmetry. 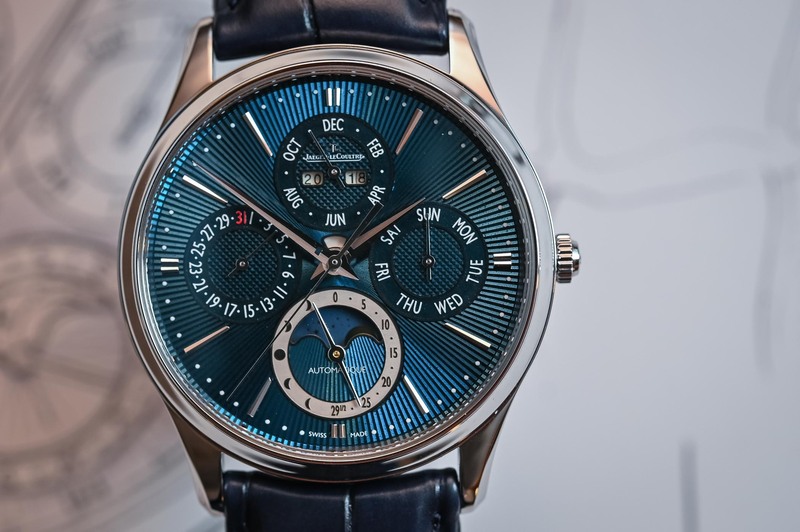 The Jaeger-LeCoultre Master Ultra-Thin Perpetual Enamel (ref. Q13035E1) comes with a matching blue alligator strap, a DIY interchangeable strap system and a white gold folding buckle. 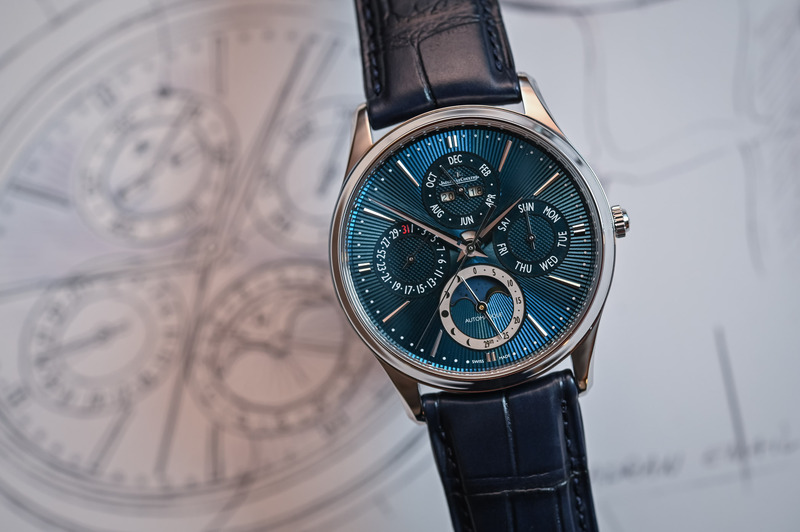 A limited edition of 100 pieces, the Master Ultra-Thin Perpetual Enamel retails for EUR 55,500. 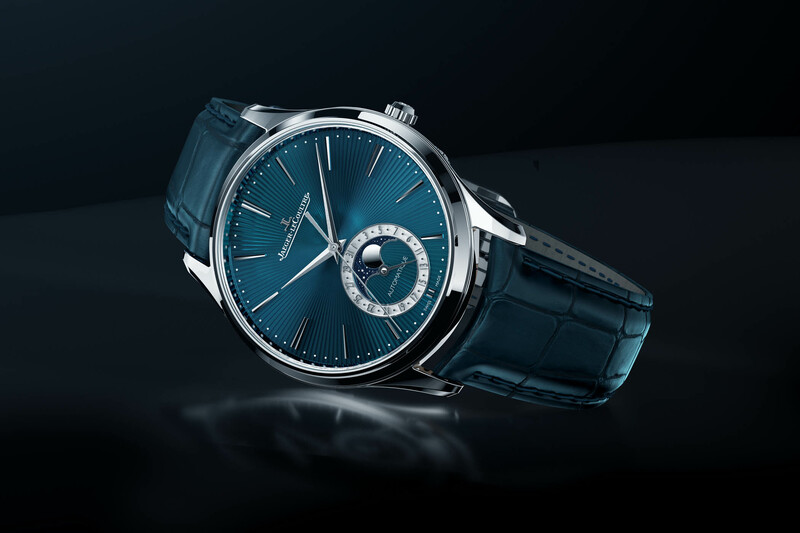 Find out more about this watch at www.jaeger-lecoultre.com. I don’t believe the window above the central axis is a power reserve indicator. Rather, it is an indicator that tells you when it’s safe to manually advance the watch. I can’t speak to this model but usually when the window turns red that is indicating a time when you cannot adjust the watch. The watch doesn’t have power reserve indicator. I think I like blue dials less and less. They look a bit cheap. That one looks cheap (reminds me of a Christmas tree bauble), but you’ve got to search for the good ones, JD. FP Journe’s Chrono Bleu is sublime, as is VC’s Overseas (but you’ve got to look for real photos of it, as VC undersell it on their website – google ‘vacheron overseas blue brown horobox’ for how it looks in reality). I think the same dialmaker made those for FP and VC, so they’ve clearly got it down to an art. I don’t know whether it is just me, but recently quite a few watchmakers seem to be going off the rails when it comes to their designs. I suspect that this is because they are chasing the Chinese market or searching around for increased profits. Just look at the mess which is the new AP “11.59”, brought to you by Literally Any Budget Design Department. This JLC also fails miserably. In trying to look expensive, it looks cheap and trashy. In fact, it does look incredibly Chinese. I am certain that I have seen a few SeaGull models which look remarkably similar. Remember when watch-makers relied on subtlety of line and proportion? 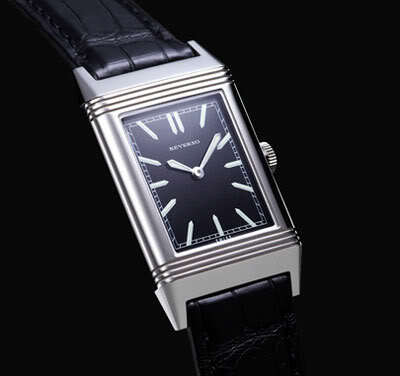 Who does not highly rate the dress watches from the Forties and Fifties- minimalist and beautiful. Quite frankly, I would have a lot more respect for JLC if they simply rebooted all of their own designs from 60-70 years ago, kept them under 40mm, concentrated on making them perfectly….and stuck with that. I recently had a look at a JLC boutique and thought, “eeeer, OK. That one looks quite nice.” Rolex get a lot of stick, but they know how to make a basic watch look special. 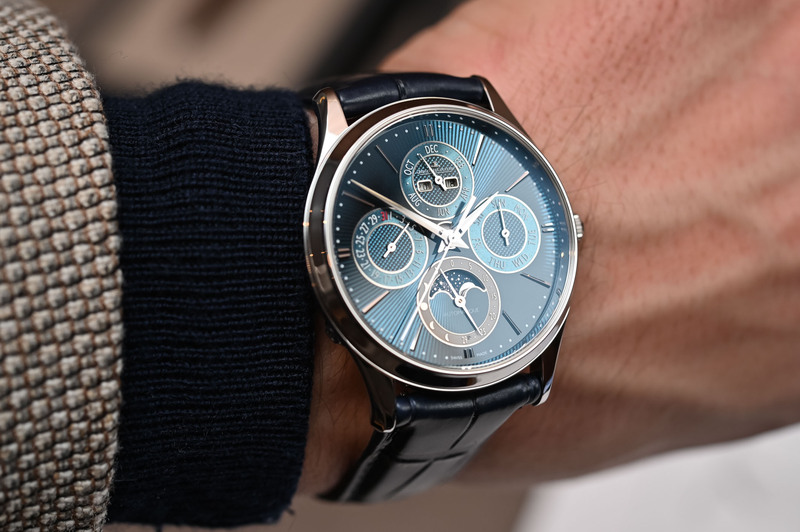 Which watches are the backbone of The High End Market? The classics. Datejust 36mm, Reverso, Genta’s designs, PP Calatrava, The Speedmaster. Which were Hamilton’s most popular recent additions? Khaki Field Mechanical from the Forties, The Intra-matic. Very nicely put and true just another guy in the web. They do look chinese when I think about it so maybe thats hwybI had this impression. Gil i googled it and it is really nice! I didnt think all blue dials are cheap. Just that I like them less because of so many failed ones. The blue Lange 1 or Panoreserve are lovely. 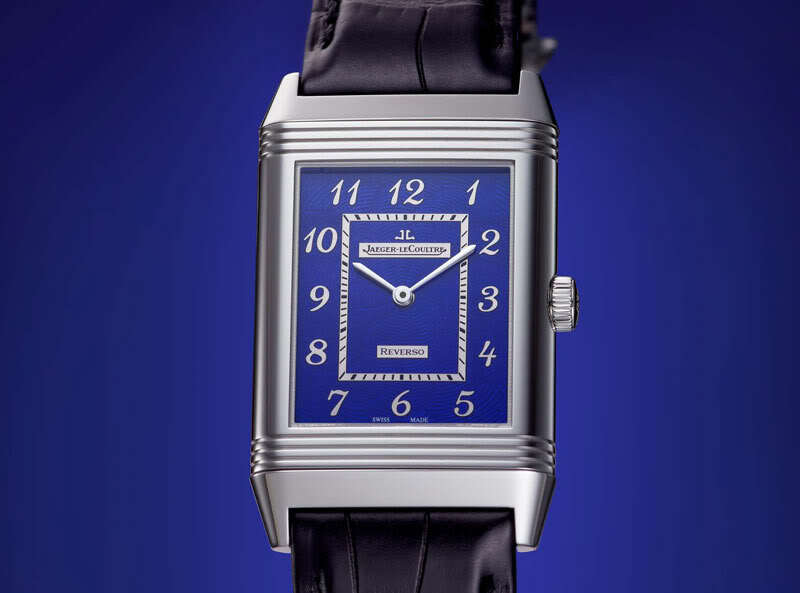 Same for the blue GO senator chronometer which is a true piece of art. I even think the blue royal oak dial is magical when you stare at the dial even though I agree the cose 1159 will go down in history and be tought at universities as one of the largest failures in history. I Just cannot be convinced no one, absolutely no one inside AP warned them aboutbreleasing such a cheap, banal, and insignificant wtach. And for 50k! Great to read from both of you as usual. I believe there is an error in the write up. There is no power reserve indicator on this watch. The small window above the central axis is a JLC feature on all their Kurt Klaus modular perpetual calendars to indicate when it is unsafe to use the quick set date feature. @WatchAddictWT you’re totally right… Corrected! @Just another guy on the web – @JD – @Gil – Quick word, as I’ve seen and worn these wacthes during SIHH… And believe me, they don’t look cheap. The execution of the dials is pretty impressive. Certainly hard to catch on photos, no doubt. And whether you like the design or not is indeed personal (and I’m not going to debate this…) However, I really can’t say that the dials look cheap. Far from that. Fair enough Brice. You did see it in the metal. JD, agreed about the blue RO dial, particularly the Jumbo 15202. I’d be hesitant to call any watch cheap looking just based on photos. Too often watches seen in the metal can convey a totally different impression. To my mind, JLC is right at the sweet spot where price and value match pretty well. These limited edition pieces are obviously pricey for JLC but it’s clear that a great deal of work has been put into them. What I’m most interested in knowing is whether these new movements and dial layouts are going to be making it into their regular production models. I think their stainless master perpetual is a tremendous value but I’ve never loved the moon phase placed on top of the dial and the year window being placed to the side is also something that I’d like to see remedied (as it is with this watch). Curious if you folks at Monochrome have any insight as to whether these changes will affect the regular line up. @Matt – no words from JLC on updating the rest of the Master QP collection with this new layout. 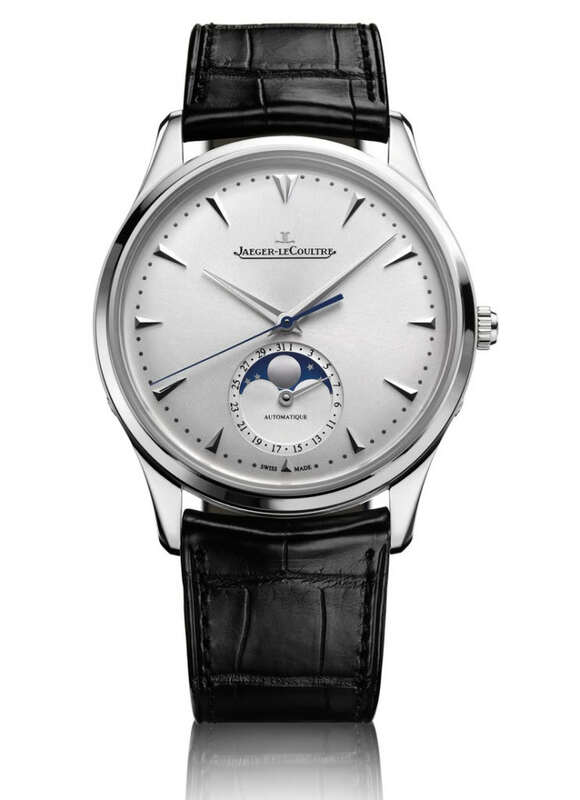 This may be the most attractive JLC yet. Gorgeous color face along white gold, saddle leather strap with a deployant clasp pairing pushes this high up on the timepiece bucket list.